Dads and their daughters had a "Minute to Win It" at the PTA-sponsored daddy-daughter evening with fun games! Participants had a great time stacking, throwing, and balancing all within a minute for prizes. Thank you PTA! Riverview students had a great week of collecting, strategizing, and 'bombing' classroom jars of pennies with their coins. At the end of the week, Mrs. Bufton's class won the upper grade contest with the most amount of money, raising $197.30! Mrs. Jorgensen's class won for the most points- meaning, they had a LOT of pennies in their jars! Miss Nelson's class won the lower grade contest also raising $197.30! Mrs. Miner's class also brought in $150.01. Wow! Mrs. Galt's 2nd grade class earned 3733 points (also many pennies!) and Mrs. Hales' kindergarten class had 1825 points. The winners received a pizza party for their hard work and awesome strategizing! Thanks everyone for your help. We raised a great amount of money for our memorial bench honoring our friends. Great work Rams!! Penny Wars has been so much fun! Look at this class counting up their change! We've made over $2000 for our memorial bench. Thank you everyone for your donations!! We'll announce the class winners after spring break. Vivian Miner, 5th grade teacher at Riverview, was presented the Crystal Apple Award. She was voted the winner by her colleagues who think she contributes amazing things to educating children. Congratulations Mrs. Miner! Riverview's Teacher of the Year! Mrs. Mejken Lacrua is Riverview's Teacher of the Year! This is Mrs. Lacrua's 6th year of teaching. She has always taught third grade and loves it! She has lived in Spanish Fork for 3 years. She has one sone whom she adores. Mrs. Lacrua said, "I love, love, LOVE my job and think of my students as my kids! They bring me such happiness each day and keep my life interesting. I feel so blessed to be in this profession." She taught at Canyon for her 1st year and has taught at Riverview for 5. Our penny war starts this week- Monday, April 2 through Friday, April 6! Our goal is to earn money for memorial benches for our friends at Riverview that have passed away. We want to remember them with special benches at Riverview. 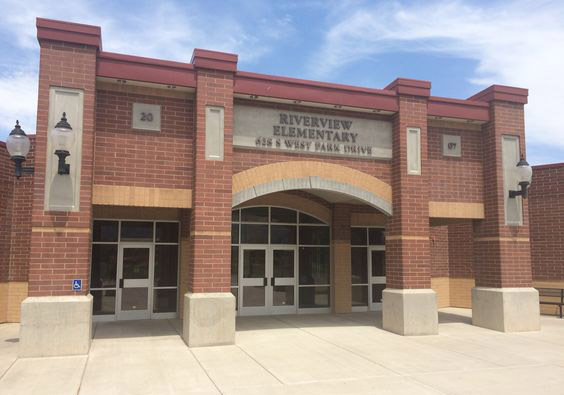 Carol Walker, Carol Condie, Ian Baker-Pierce, Valeria Gutierrez, and Dax Christensen were all a special part of Riverview. We love them and miss them dearly. Help us earn money to remember them and what they meant to us. Students, bring in your pennies and any silver change you have or find around the house! You can put your pennies in your classroom jars, or any other classroom's jar. You can "bomb" another classroom's jar with your silver change. That class will then lose 5, 10, 25, or 100 points depending on the coin you use to bomb. Your teachers will provide you with more rules. 2 classes will win the most points from pennies, and one class will win with the greatest amount of money earned.